Small is in! Everyone wants everything smaller - well OK maybe not EVERYTHING, but when it comes to technology, small is the way to go if you want to sell products! The Clickfree Traveler is the world's smallest totally automatic PC backup device! This amazing piece is as light as a pen and the size of a credit card allowing it to easily slip into a wallet allowing business travelers, photographers, music lovers and others to carry up to 64GBs of data in their hip pocket or purse. Also new, the Clickfree DVD Transformer enables consumers to quickly and easily back up important data to optical discs, bypassing tricky CD and DVD burning software. Coupled with recordable CDs and/or DVDs, it's an inexpensive yet foolproof way to back up important files. 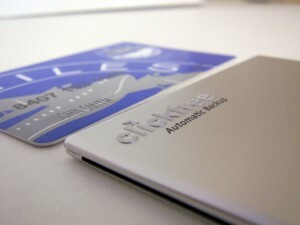 Despite its small size, like all Clickfree products, the Traveler includes an auto-launch feature so there is no need to install or configure software. Just insert the Traveler's USB plug into a PC, and Clickfree does the rest, searching, copying and organizing more than 400 file types of digital data including documents (Word, Excel, PowerPoint), Outlook email and contacts, photos, video, music and even favorite websites. Road warriors and other professionals who typically operate with large amounts of data (photographers, graphic artists, financial planners), will find the Clickfree Traveler lets them carry hefty presentations or huge art portfolios in their wallet or purse. With the Traveler, business professionals will always have easy access to important content and can quickly restore critical information in the event of a lost, stolen or malfunctioning computer. Netbook users will find it a perfect complement to these smaller devices, allowing them to carry even more data without increasing their load. 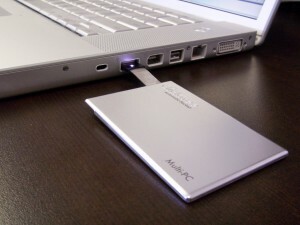 The Clickfree DVD Transformer is also a small, flash-based device that connects to a PC's USB port, automatically searching the entire computer for documents, photos, music files, videos and more.¬† Once the search is complete and the content identified, consumers simply insert a blank disc into the computer's burner and Clickfree does the rest.¬† Tricky CD and DVD burning software is now a thing of the past. To purchase or get more information on either of these products, please visit Clickfree! We are sure there will be a product that is perfect for you!